Republican vice presidential candidate Sarah Palin on Saturday accused Democrat Barack Obama of "palling around with terrorists" because of an association with a former '60s radical, stepping up an effort to portray Obama as unacceptable to American voters. Palin's reference was to Bill Ayers, one of the founders of the group the Weather Underground. Its members took credit for bombings, including nonfatal explosions at the Pentagon and U.S. Capitol, during the Vietnam War era. While Obama and Ayers live in the same Chicago neighborhood, served on two boards and had at least one political connection, it is a stretch of any reading of the public record to say the pair ever palled around. And it's simply wrong to suggest that they were associated while Ayers was committing terrorist acts. The Republican campaign, falling behind Obama in polls, plans to make attacks on Obama's character a centerpiece of candidate John McCain's message in the final weeks of the presidential race. Coming late in the campaign, Palin's remark could be particularly incendiary, however, and could knock Obama off his focus on the troubled economy. The Obama campaign called Palin's remarks offensive but not surprising in light of news stories detailing the campaign's come-from-behind offensive. "What's clear is that John McCain and Sarah Palin would rather spend their time tearing down Barack Obama than laying out a plan to build up our economy," Obama campaign spokesman Hari Sevugan said in a statement. Palin's remark about Obama "palling around with terrorists" comes as e-mails circulate on the Internet with suggestions that the Democratic candidate is secretly a radical, foreign-born Muslim with designs against the U.S. - even though Obama is a native of Hawaii, a Christian and has no connections to Muslim extremists. 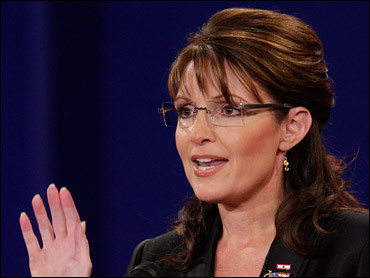 Palin, Alaska's governor, said that donors on a greeting line had encouraged her and McCain to get tougher on Obama. She said an aide then advised her, "Sarah, the gloves are off, the heels are on, go get to them." The escalated effort to attack Obama's character dovetails with TV ads by outside groups questioning Obama's ties to Ayers, convicted former Obama fundraiser Antoin "Tony" Rezko and Obama's former pastor, the Rev. Jeremiah Wright. Ayers is a professor at the University of Illinois at Chicago. He and Obama live in Chicago's Hyde Park neighborhood and served together on the board of the Woods Fund, a Chicago-based charity that develops community groups to help the poor. Obama left the board in December 2002. Obama was the first chairman of the Chicago Annenberg Challenge, a school-reform group of which Ayers was a founder. Ayers also held a meet-the-candidate event at his home for Obama when Obama first ran for office in the mid-1990s. In an interview with CBS News earlier in the week, Palin didn't name any newspapers or magazines that shaped her view of the world. On Saturday, she cited a New York Times story that detailed Obama's relationship with Ayers. Earlier Saturday, Palin spent 35 minutes at a diner in Greenwood Village where she met with Blue Star Moms, a support group of families whose sons or daughters are serving in the armed forces. Reporters were allowed in the diner for less than five minutes before being ushered out by the campaign.